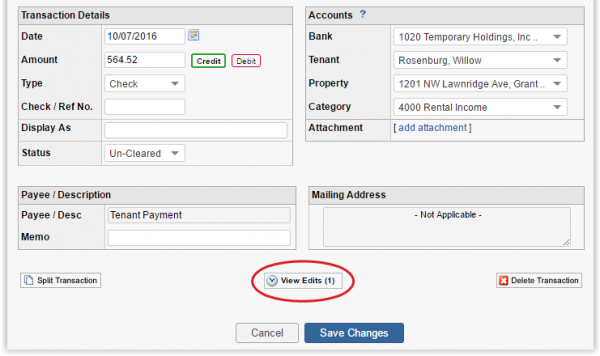 This feature makes it easy for account managers to see if any accounting transactions have been added, or changed in the system and who made the addition or edit. When you have multiple users creating and modifying transactions in your accounting system, account managers need to keep track of who created or modified a transaction. This new Transaction Audit Log provides the answer for Rentec Direct clients! Detailed information of the changes that have been made are listed in an expandable row on click. 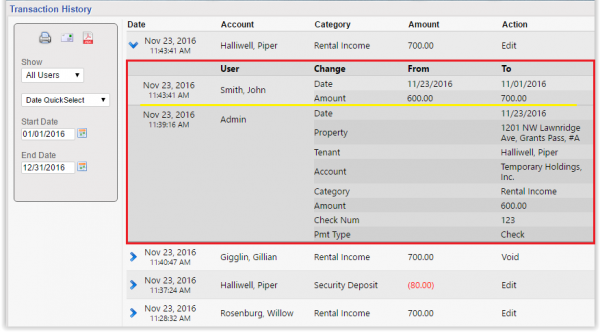 A glimpse of a modified transaction will show which user edited an amount, as well as relevant tenant, property, and account information related to the transaction. Transaction History can be printed, exported to pdf and emailed. This new transaction history details feature is currently only available to account managers. From the Settings tab >>go to Utilities. Click on the link for ‘Transaction Edit History’ on the bottom of the list. From here you will be able to view all the transaction history of your account. You can specify which user’s transaction history you would like to view and/or select a date range. You can view the history of an individual transaction. If a transaction has been previously edited, there will be a button to view the edit details. This new feature from Rentec Direct is designed to give you reliable tools to make your property management business more successful. With a transaction history audit log you will be able to identify and correct errors, reconcile bank accounts more efficiently, provide transparency, and train employees confidently. And if you suspect anything fishy happening to your accounts or funds, the transaction history audit log will aid you in identify suspicious activity.